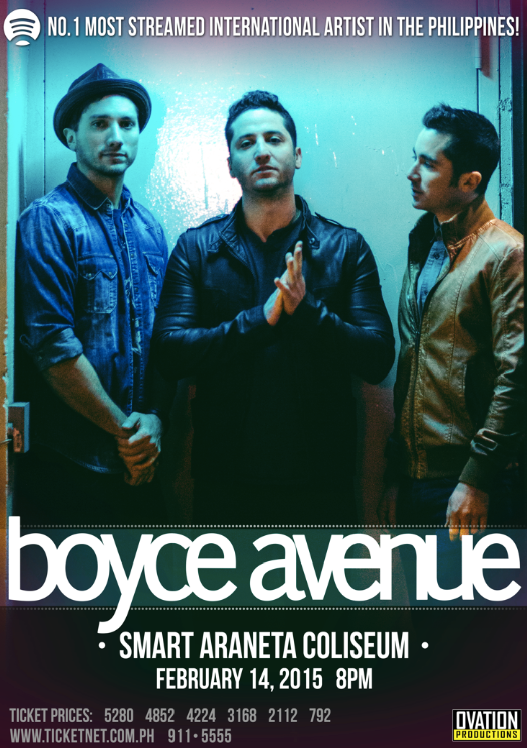 Filipino fans of the boy band Boyce Avenue will have an extra joyful Christmas with the official announcement that the band will be staging another concert in the country early next year.The band announced on their official Facebook page that they are indeed coming to Manila on February 14, 2015 for a live concert at the Smart Araneta Coliseum in Quezon City. The band posted, "PHILIPPINES!!! We are SO excited to announce we're coming back to your beautiful country 14 Feb and we're playing at Smart Araneta Coliseum!!" Boyce Avenue is a three-member band composed of Alejandro Luis Manzano, Daniel Enrique Manzano, and Fabian Rafael Manzano. They are most well-known for their covers of popular songs which they regularly post on YouTube. They have released two studio albums - All You're Meant to Be in 2009 and All We Have Left the following year.